Learn about the temperament and personality of the Yorkshire Terrier. Discover what he's like to live with, his traits and characteristics and how he generally behaves. And look at lots of Yorkshire Terrier photos. The Yorkshire Terrier is feisty, alert, inquisitive, energetic, determined, brave, bossy, scrappy and boisterous. But he can also be very sweet. He can be described as a little dog with a big personality! He's one of the most popular breeds in the Unite States. He craves close physical contact and affection and will follow you around the home like a shadow. His prey-drive is high and he will chase any little creature that scurries by him. He gets along well with strangers but he can be aggressive with other dogs. He's very affectionate and loves to cuddle and sit on your lap. 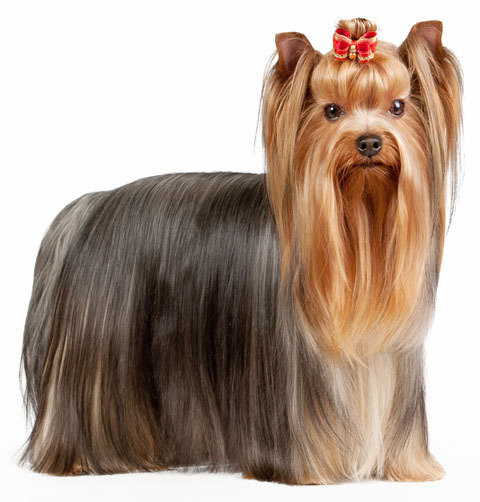 The Yorkshire Terrier sheds practically no hair at all. You'll virtually never find a hair in your home!